TEHRAN, Iran (CNN) -- Among the hundreds of detainees arrested in the aftermath of Iran's disputed presidential election, there are 50 "political figures" accused of playing key roles in violent street demonstrations after the vote, Iranian media reported Wednesday. 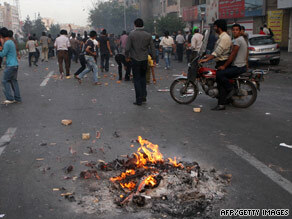 In the aftermath of Iranian elections in June, protesters hit the streets. About 200 others, whom the Judiciary has linked to the demonstrations, also remain behind bars, said Kazem Jalali, spokesman for the parliament's national security and foreign policy commission. That's according to the semi-official Iran Student Correspondents Association (ISCA). However, Judiciary spokesman Ali Reza Jamshidi put the figure at 300, state-run Press TV reported. Hundreds of people were detained after the elections, when Iran's government cracked down on supporters of reformist candidate Mir Hossein Moussavi, who took to the streets to protest what they called a fraudulent presidential election. That election handed hardliner Mahmoud Ahmadinejad a second term in office. But officials say "only the organizers of the conflict" are still behind bars. Government officials announced last week that the "confessions" of the remaining detainees would soon be broadcast. The Iranian government released 140 people arrested in post-election demonstrations from Evin prison Tuesday, and prominent Iranian reformist Saeed Hajjarian was set to be released Wednesday, the semi-official Fars News Agency reported. A spokesman for Iran's courts announced Hajjarian's release, prompted by a recent order by Iran's judicial chief to expedite the processing of files for all those arrested in post-election demonstrations, Fars said. Hajjarian, 55, is one of several jailed reformists accused of orchestrating the post-election violence in Iran. Hajjarian, considered the theoretician behind Iran's reformist movement, was extremely influential until a 2000 assassination attempt that left him severely disabled. He was shot in the head, suffered brain and spinal cord injuries and was confined to a wheelchair. His wife, physician Vajiheh Marsoussi, visited Hajjarian in prison. She told Human Rights Watch that his medical condition was "deteriorating severely." Meanwhile, trials are planned for 20 people "accused of carrying out acts of sabotage in the course of the post-election protests in Iran," starting Saturday, Press TV reported. A task force of made up of members from national security and foreign policy commission has been charged with investigating circumstances around the arrest of the detainees and their treatment at the prison. Its members "visited Evin prison and were brought up to date regarding the status of some of the detainees," the spokesman said Tuesday. Jalili told reporters Wednesday that the detainees appear healthy and have not been "disrespected in any way," though task force was not able to visit all of them. "The only issue posed [by the prisoners] was the length of their detentions," he said, according to ISCA. He said the task force planned to meet with the 50 political detainees at a later date. Among those still reportedly detained is Shahpour Kazemi, the brother-in-law of Moussavi, according to Moussavi's wife. Others include Behzad Nabavi, a Moussavi ally, and Mostafa Tajzadeh, who served under Iranian President Mohammad Khatami -- a Moussavi supporter -- the Iranian Labor News Agency (ILNA) reported Tuesday, citing Farhad Tajari, deputy chief of the parliament's judicial and legal commission. Though official numbers have not been updated for weeks, Tajari told ILNA that "evidence shows that ultimately 30 people were killed" in the post-election fallout. Moussavi and a fellow presidential candidate planned to commemorate those deaths Thursday at Tehran's largest cemetery, despite the government's rejection of a request to hold a public ceremony at the site for Friday prayers, according to Iran's Norooz News. Thursday would mark the 40th day after the fatal shooting of 26-year-old Neda Agha-Soltan, whose death has come to symbolize Iranian resistance to the government's official election results since it was captured on amateur video. For Iranians, a predominantly Shiite Moslem population, the 40th day marks the last official day of mourning in the immediate aftermath of a death.